I have had this design in mind for awhile now but just barely had the time to get it down on paper and then all sewn up. I made this quilt for me, but as soon as it was done my 18 month old took it and has never let me have it back. Funny little girl. She tries to drag it with her wherever she goes. 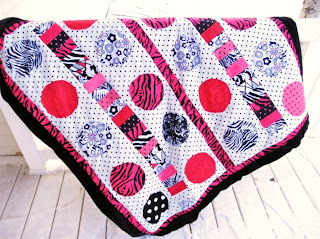 I quilted this blanket as a quilt as you go quilt (which means you can quilt the blanket as you are sewing it together.) 2 steps in 1! Making it a super quick and fun quilt to make. The quilt pattern is available HERE. I am also going to be including the instructions to make a car seat tent to match this adorable blanket. PS- I found your blog on Blog Frog. Cute quilt and I would take it too if I were around! !